A Cambridge builder of health information systems is testing two pioneering medical technologies in West Africa that could help limit the transmission of Ebola from patients to doctors. An electronic health record system and a robot with a two-way communication system — basically an iPad on wheels — are among the tools Deborah Theobald, co-founder of Vecna Technologies, brought to Monrovia, Libera, in late November. The robot is called VGo, built by another local firm, VGo Communications Inc. of Nashua. It looks like a four-foot pillar on wheels, and carries a display screen and a camera and can be controlled remotely using an iPad app. Typically used in medical or school settings, the robot facilitates two-way communication between doctors in a hospital, for example, and nurses or even patients in a field location. Both technologies could be used by health workers to assess and treat quarantined patients without coming into contact with them and risk being infected with the deadly disease. Using VGo, for example, doctors can monitor Ebola patients without breaching the quarantine zone. Theobald’s goal during her trip to Liberia is to introduce workers to the records system and robot, and train them to use both. The company’s philanthropic arm, Vecna Cares, is partnering with the International Rescue Committee, which has been active during the Ebola outbreak in West Africa. The VGo robot has been used at Massachusetts General Hospital and Brigham and Women’s Hospital. Logistics have delayed its use in Monrovia so far, Theobald said, but this past weekend it did make its debut in neighboring Sierra Leone at an Ebola treatment center. Theobald is also carrying an electronic health record system that Vecna has designed for use in remote rural health clinics. The main unit, called CliniPAK, fits inside a suitcase and draws power from a variety of sources, including car batteries or solar cells. At locations off-the-grid, the unit can serve as a database for health records, and also host a local Wi-Fi network for the health campus. 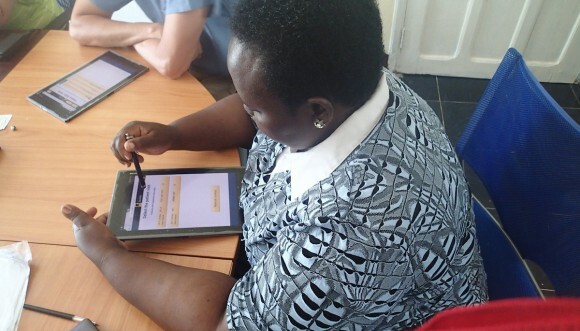 Health workers enter data on Sony Experia tablets (which are dipped in a chlorine solution between patient meetings), the system backs up health records in a cloud-based database using cellular data networks. Medical centers in Kenya, Zanzibar, and Worcester, Mass., are already using CliniPAK. Theobald’s unit will be bolted into place at a new 100-bed IRC Ebola treatment facility due to open beside the football stadium in Monrovia. The role of robots for use in disaster situations such as an Ebola outbreak was the subject of a national tech summit hosted by the White House Office of Science and Technology Policy in November and held at several locations, including Worcester Polytechnic Institute. Though robots have participated in disaster responses since the World Trade Center bombings, they have yet to work side-by-side with people in health emergencies. Part of that is because relief workers may be reluctant to try unfamiliar systems in the aftermath of a natural disaster. “When the crisis hits, they don’t want an unknown that can betray them. Paper can’t betray them, or that’s the perception,” Theobald said. Vecna Technologies itself is building a robot, called BEAR, that can carry people, such as wounded soldiers from a battlefield. But BEAR did not travel to Monrovia. “I think the BEAR would terrify people. So we have to start smaller,” Theobald said.